Vitamins & MineralsNOW Foods Vitamin C-1000 Complex - 90 tabl. 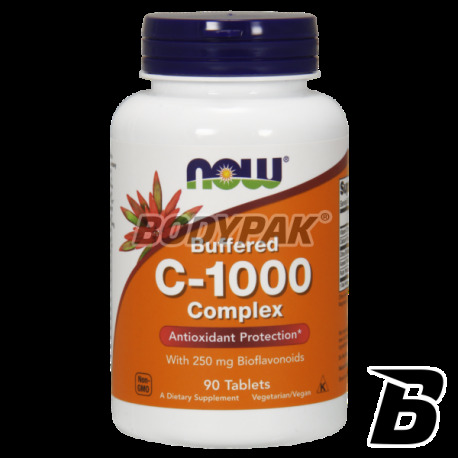 Trec Vitamin C 1000 Ultra Bioflav - 100 kaps. 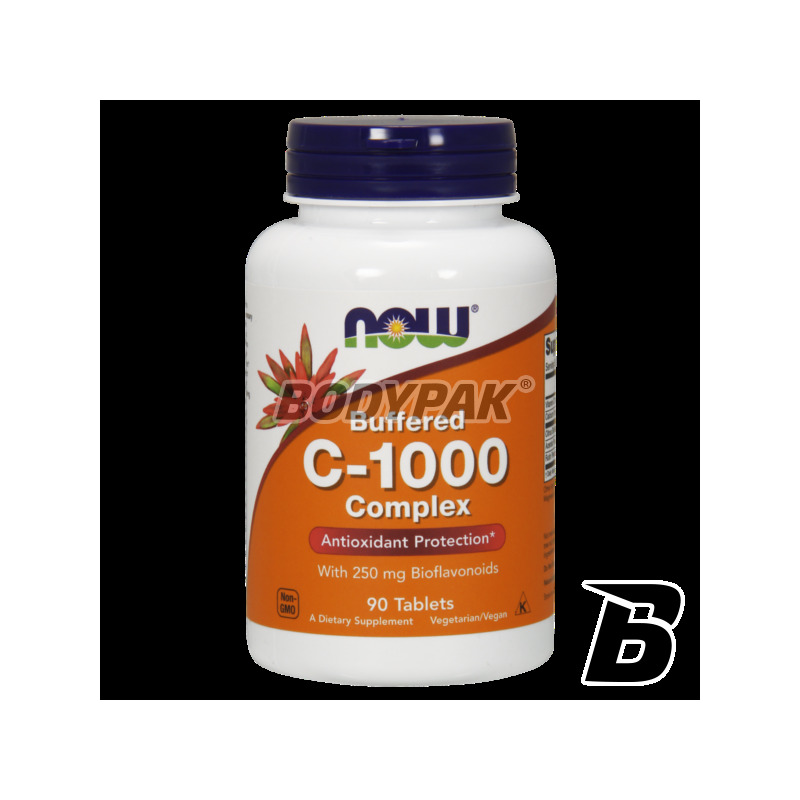 NOW Foods Vitamin C-1000 Complex - 90 tabl. High-quality dietary supplement containing vitamin C increased dose. The product was developed specifically for people with increased demand for highly bioavailable and effective vitamin! NOW FOODS Vitamin C-1000 Complex is the newest form of Vitamin C, which has a very high bioavailability and efficiency of operation, and the lack of negative impact on the digestive system and kidneys. Citrus bioflavonoids - strengthens the immune system, fight free radicals, enhance well-being. Acerola - is one of the fruits with the highest content of natural Vitamin C.Dzięki high content of bioactive substances of vegetable and mineral is easily digestible and many times more effective than synthetic Vitamin C.
Rutin - a flavonoid with strong antioxidant properties. Why vitamin C is essential for our body? Vitamin C is a substance which the body is unable to produce itself, but which is extremely important in many biochemical processes and metabolism. Functions that vitamin C plays in individual cells have a direct impact on fitness and healthy functioning of the body. Thanks to its particular structure, on the one hand is involved in many processes in which the products are essential in the daily life of our body substances, on the other protective functions, like a guard protecting us from the adverse effects of chemicals from the environment around us, and those who are a byproduct of metabolism. Let's take a closer this remarkable molecule and the tasks they meet. Why vitamin C is important for the immune system? Vitamin C has a very beneficial effect on the functioning of the immune system. Thanks to its special properties, helps to maintain the proper balance within the immune system, reducing his airway. A balanced immune system runs faster and more efficiently in contact with harmful pathogens (viruses, bacteria) or adverse environmental factors (pollution, toxins). In addition, vitamin C increases the activity of immune cells, increasing the body's natural immunity to infection. Vitamin C - conqueror of free radicals! Free radicals are highly reactive substances, which make the damage within many systems of the body. Millions of our cells every day are exposed to real bombardment by these by-products of metabolism. This causes DNA damage, protein oxidation of fatty min. circulating molecules of bad cholesterol, and many other processes have a destructive effect on the body, causing accelerated aging. Vitamin C is strong in chemical reducing agent (antioxidant) which very effectively neutralizes and destroys free radicals. Why vitamin C is essential for our skin? The skin is the largest organ of our body, and for its extraordinary resilience and flexibility corresponds to the collagen. It is a protein which is more than 70% of the total protein in the body and is responsible for the integrity of the tissue. The collagen acts as a binder - the fibers give the proper structure and flexibility min. skin, bones, tendons, joints, blood vessels, nabłonkom and nails. In addition to providing proper skin condition, it is very important in the healing process of wounds. At the first stage it is produced large amounts of collagen, which is used to fill any resulting damage. Its creation is necessary vitamin C, which is responsible for the body's normal production levels of collagen, as well as fast and efficient healing process of damaged skin. Inne składniki: kroskarmeloza sodowa, kwas stearynowy (roślinne źródło), celuloza, stearynian magnezu (roślinne źródło), fosforan diwapnia, dwutlenek krzemu i wegetariańska powłoka.